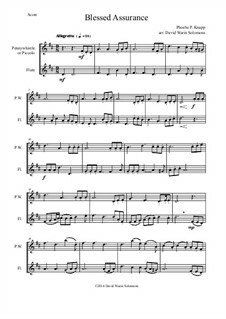 In response to a request from a flute and penny whistle player I have made these simple duo arrangements of six public domain Christian hymns. 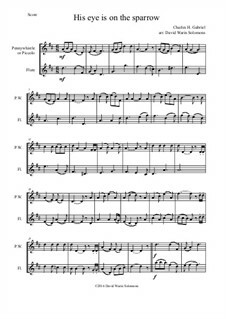 The parts are written in D (as is usual for folk instruments) and the top part can be played on a penny whistle in D or on a piccolo. Because the penny whistle is basically monochromatic I have avoided accidentals for it. In each piece the tune is carried by the top instrument in the first half with the other instrument providing a countermelody and in the second half they swap round. The sound sample is an electronic preview of "His eye is on the sparrow" using piccolo and flute sounds. 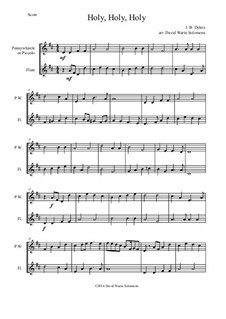 These are based on my arrangements of six public domain Christian hymns originally written for penny whistle and flute. 2 equal F recorders (alto recorders). (The 2 equal F recorder versions could also work on bass recorders). The sound sample is an electronic preview of "His eye is on the sparrow". 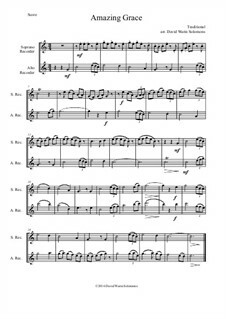 The sound sample is an electronic preview using piccolo and flute sounds. 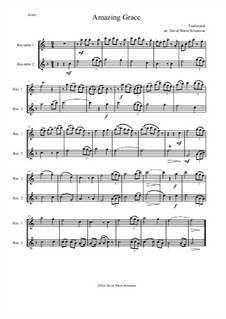 Complete set, for penny whistle (or piccolo) and flute Arranged by Solomons D.W. 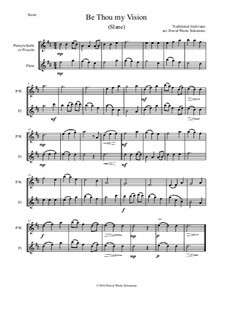 Complete set, for two soprano recorders or two tenor recorders Arranged by Solomons D.W. 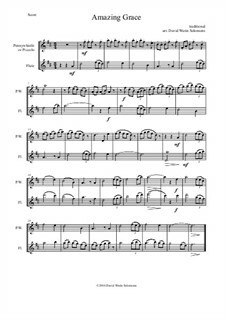 Complete set, for soprano recorder and alto recorder Arranged by Solomons D.W. 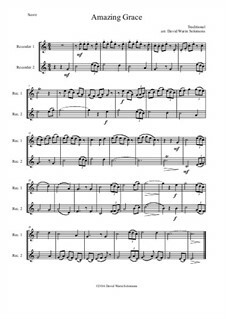 Complete set, for two alto recorders Arranged by Solomons D.W. Victory in Jesus for penny whistle (or piccolo) and flute Arranged by Solomons D.W.
Holy, Holy, Holy (Nicaea) for penny whistle (or piccolo) and flute Arranged by Solomons D.W.
Amazing Grace for penny whistle (or piccolo) and flute Arranged by Solomons D.W.
Be Thou my vision (Slane) for penny whistle (or piccolo) and flute Arranged by Solomons D.W.
His eye is on the sparrow for penny whistle (or piccolo) and flute Arranged by Solomons D.W. 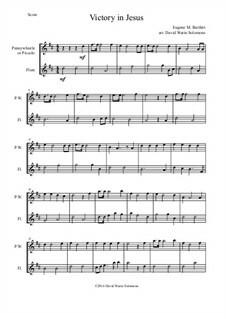 Blessed Assurance for penny whistle (or piccolo) and flute Arranged by Solomons D.W.